Please refer to our stock # 1-0775 when inquiring. 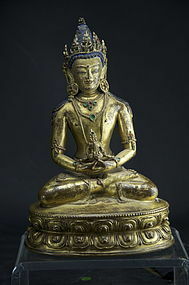 Gilt Bronze Statue of Buddha, Tibet, Ca. 17th C. Tiny Statue of Adibuddha Vajrasattva, Tibet, 19th C. Statue of Shadakshari Lokeshvara, Tibet, 18th C.